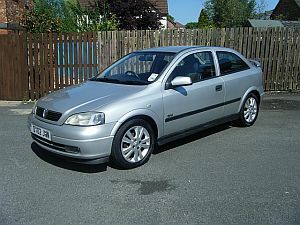 Description of car for sale : Vauxhall 2002 O2 Astra 1.8 16v SXI Manual petrol Silver £1,300 105,000 miles, "MOT May 2013 TAX July 2012 Recent Service, Cam Belt & Full Exhaust System, Electric Windows, Alloy Wheels, A/C, Remote Central Locking,Boot Spoiler. Very Reliable And In Very Good Condition For The Age. Reluctant Sale Due To Expanding Family."